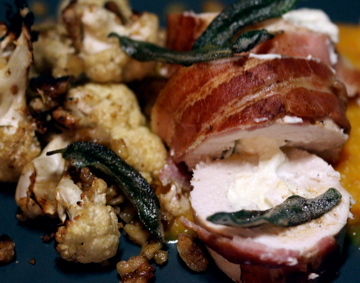 Ok, so you may have seen this dish prepared lots of different ways with all sorts of crazy combos for the stuffing. I cooked this just last week but I thought it was ‘too easy’ and wasn’t going to post it, but here it is anyway. I like to keep chicken involtini really simple so it’s quick and easy to make. Although, you can think of this recipe as a bit of a blank canvas and play with flavours depending on what’s in season and what you love. For example, I remember once buying beautiful bright yellow juicy, sweet capsicums, roasting them slowly, peeling off the skin and putting chunks of that in the middle of the rolled chicken breast. You could add whatever you like to the filling really, and the rolls certainly look pretty when you cut into them. Also, instead of bacon I’ve used prosciutto (I suppose I felt like spending a small fortune that day or maybe I was trying to impress someone) and when there’s just no pork you can lace anchovies across the top (and hope they stay atop)! Do whatever you want, basically. I’ve put a suggestion for a sauce at the end of this recipe which goes really well with this dish if you have a bottle of cider and some onions lying around! Butterfly open each breast (this lady will show you how http://www.youtube.com/watch?v=Ot46Cueod4s ). You may want to pound them a little to thin the meat if the breasts are thick. Lay them skin side down on a chopping board. 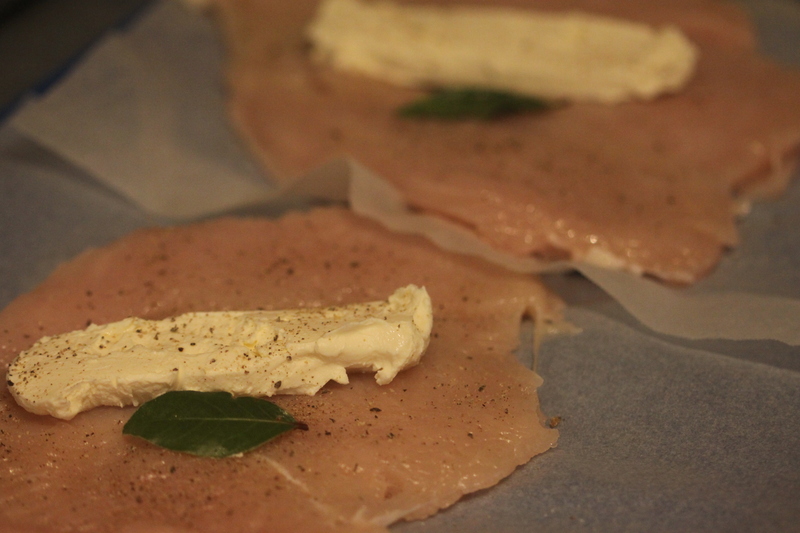 Place a stick of cream cheese in the centre along with a bay leaf and season with salt and pepper. Roll the chicken breast, tucking in the ends first and then rolling the sides, one over the other. 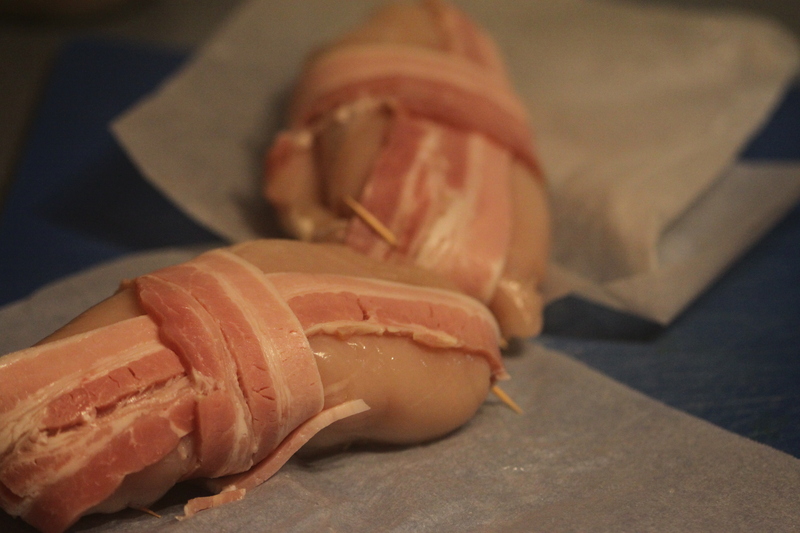 Remove the middle section of the bacon (the round bit) and wrap the strip around the chicken lengthways or widthways or both – it doesn’t really matter. Secure the bacon in place with toothpicks. The chicken rolls are now ready to be fried in a pan for about 10 minutes to crisp the bacon, then be put into a moderate oven for about 10-15 minutes. In a separate pan, melt about 2 tablespoons of butter and once hot and bubbling, throw in 10-12 sage leaves and fry them until they go crispy. Set the leaves aside on paper towel. Reserve the butter for the cauliflower side-dish. Simply toss all ingredients in a bowl, then place in a large metal baking dish and cook in a 200 degree oven for about 30 minutes. It’s important to toss the cauliflower about every 10 minutes or so. You can finish it off under a hot grill for a little extra colour if you like (I do). Simply cook a sliced onion in some butter until soft and lightly golden, pour in three quarters of a stubby of apple cider (and drink the rest) and a splash of chicken stock if you have it. Season with salt and pepper and reduce by about half. Voila!